Over the last few days I have been exploring new streams. With this exploration one finds many new sights, some from the stream and some from the surroundings. The hikes into some of the areas have been tough and the humid weather has not been kind. One who chooses to fish these places will find rewards that can't be found elsewhere. Some of the brook trout have been spectacular both in there ability to elude capture and their sheer beauty. I have said many times that for as many of these wild jewels I have caught their beauty puts me in awe. All the insect bites and sweat, the tired muscles, and the scraped knee were well worth it. I hope these images can show you what a wonderful experience a small stream can bring. I'd like to introduce you to "Spikey". He has been around for a short time but has made an impression on this angler. He is not a nymph, even though he make look like one because of the bead head. I would rather call "Spikey" a soft hackle. He is constructed of a brown hackle tail, thin silver wire rib, opossum dubbing and starling soft hackle collar. On "Spikey's" first outing he did quite well for himself, bringing many strikes and a few to hand. He was badly chewed up and even lost his collar, but still continued to battle on and win. Next time be sure to seat the hackle better and put a few more wraps of thread around it. Soft hackle wet fly or nymph....what say you? A New Blue Line, glacial almost. An outing I took last week to fish a new blue line, a glacial blue line. The hour plus drive put me on a road that winds up a mountain with a stream that flows down a steep gradient over some impressive boulders and countless blow downs. The storms that blow through this area must be some doozies. I managed to find a cut off along side the road and my little Honda just fit. The sun was up for an hour already but the stream was dark, hemlocks and maples made sure of it. I geared up and walked through the woods to the stream. The first pool I came to really took my breath away. The water flowing looked like water I have seen in videos flowing out of glaciers. The water appeared to be white, and the reason was the streams bottom, which was white sand and very light gravel. Stepping into the water I felt like I stepped into ice water. The stream thermometer came out and the temp was 56 degrees. All through my time fishing here I checked the water and the warmest it got was 58. Now I was in a cold stream, good water flows, and lots of cover, the only question remaining was, are there brook trout here? The answer was yes. Flies that were drifted in such places were able to wake up the waters with slashes and splashes. Most of the brookies were like this. Very dark in color which is surprising for such a light colored stream bottom. After a morning of fishing I went back to the Honda for a snack. I had a nice hot coffee in the early morning and left it in the cup holder. What was left was cold but still tasted good with the peanut butter crackers. I scanned the map and found I could fish another area stream for an hour or so, well off I was. This stream was also flowing nicely, and the brook trout were just as friendly. There are another 3-4 streams located near here that I want to check out.....maybe this week. A north river, we all pretty much have one. 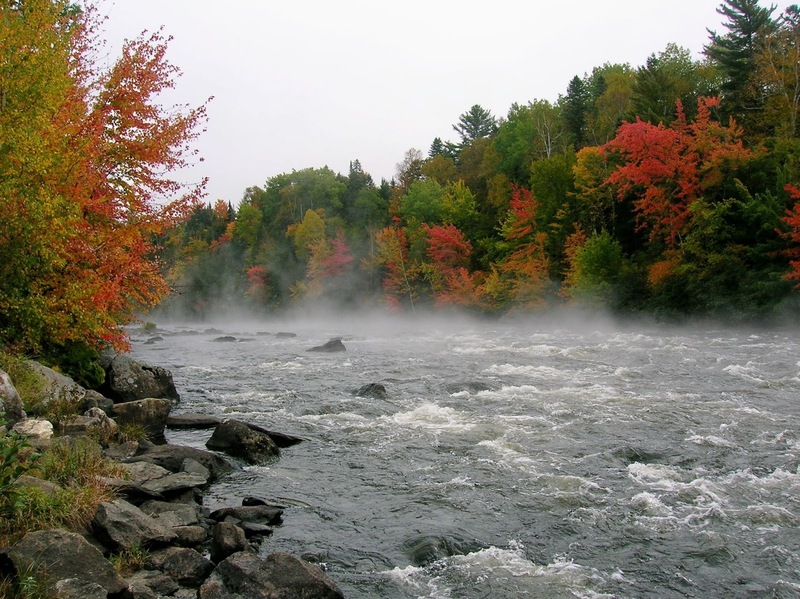 There are numerous north rivers here in New England. A north river doesn't have to be the true name of that river for it can also be the location. The river pictured here is a beautiful river in northern New Hampshire in the Fall. Truly spectacular. The streamer tied for the rivers of said name "North River" helps to pay a tribute to such rivers and all they inspire. Well folks the summer has arrived. The heat here in Connecticut is locked in place and will be around another day or so. The last time I fished was Friday and probably won't fish a stream until mid week. What I have been doing is taking care of my peppers which are doing well on the deck farm, and reading, in this case re-reading. Kathy Scott's book "Brook Trout Forest" has so many wonderful lines and thoughts, that they are worth a second and third look. Some of these lines I'll share with you in future posts. I have also been doing a little fly tying. The streamers which are well known have been scaled back and what came out of the vise are "mini" variations of those streamers. The streamers are tied on Mustad's C53S hooks in size 14. My next outing I'll run them through a few likely places and see what happens. Try to stay cool my friends. Rowan stalking wild brook trout. Yesterday I had the pleasure of spending several hours fishing with Rowan, aka RM Lytle. He is the young man who writes a blog known as "Connecticut Fly Angler". 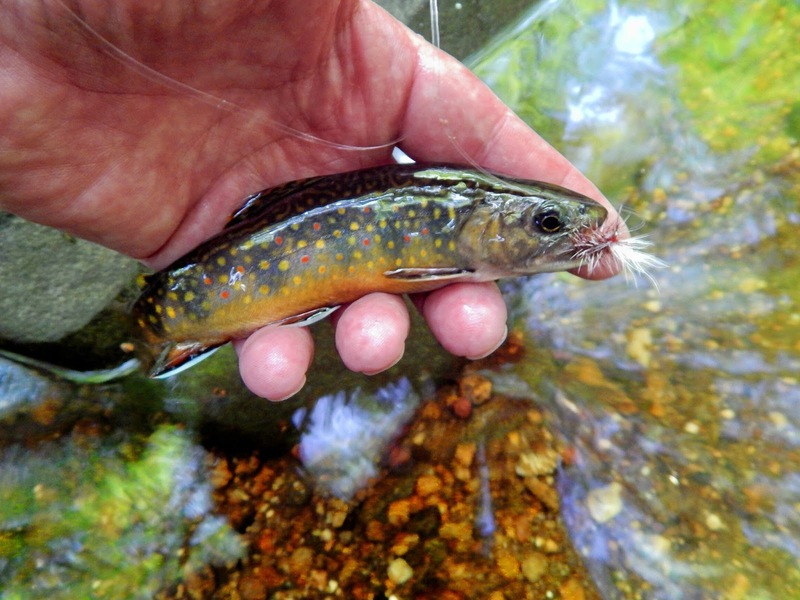 He is also a small stream angler who has found a special love for wild brook trout. We met and fished a stream that has a population of brook trout but are attempts to get a few to take the fly were not successful. So it still being early and the weather being so beautiful we decided to try another stream. This stream is a short drive from the first and when we got there found it to be in wonderful shape. Rowan remarked as we were walking, that I can hear the water, that's always a good sign. The first few pools we fished showed some mini brookies, some so small they could not take the fly. As we moved upstream to some better pools, I was to hear Rowan yell, I knew he was into a fish, one of many we were to take as we fished to the streams headwaters. A very nice brookie taken by Rowan. We continued to move upstream finding one inviting pool after another. A few fish were also hooked in some of the deeper runs. My first brook trout of the day. The "bomber" strikes again. This pool has several places where one might find a willing brookie, but it has one "sweet spot" where you know a fish lurks. Know where? Another "bomber brook trout". The bomber and a black ant were the only flies that worked for me that day. The fishing can be tough at times, but the rewards cannot be measured in any words I can describe. You can read Rowans account here http://flyfishingcts.blogspot.com/ It was so good to fish with you this day. What do you think of my lunch? A field of color, and a handful of color. Wednesday was a transition day for our weather. It was a very humid morning which turned even more so as the day progressed, but thankfully that was pushed out and a more refreshing day followed. But this post is about the nasty day before and one of my finest days of fishing to date. It seems that this year I have had several of those days and just when I think that was my best another one comes along. I can't explain it but perhaps it had something to do with that awful winter we went through. I arrived at the parking area and the first sight I see is this beautiful field of wild flowers, what a beginning. Geared up I started upstream. There is a small foot bridge where I usually toss my first fly and today was no exception. The fly hit the water and was soon taken. Someone once said "never pass up a pool under a bridge", I'll never argue with such wisdom. My first brook trout of the day. These fish are so spunky, and beautiful. You can see the humidity. The cool waters gave a look of Halloween at times. I fished this stream for quite some time. I was fortunate to take a few brookies along the way. All outings come to a close, and I don't complain for I know I'll have many more chances to to cast a fly on such intimate waters. This was my last run I was to fish. I started the fly drifting when a trout rose and missed the offering. I retrieved the fly and waited a few moments and sent it off again. This time as the fly completed its drift and hung there the trout rose again, and again he missed. While retrieving again I saw the trout swim up from behind and pounce on the fly. Hook set and the glass 3wt bent. A brief battle ensued, the fish running to every location in the area. Eventually the 3wt won. As the trout laid at my feet I could not describe my feeling. I have caught many brook trout in my life but when I come upon one like this I still get shaky, and that's the truth. He was incredibly beautiful, the photo does not show it's true magnificence. A fast photo, really two and off he went. This day started bright and colorful, and ended even more so. A wood fly box...perhaps a turkey call. Motor vehicles have lots of nooks and crannies in them, especially the ones made after the nineties. There are primary and secondary glove compartments, giving away my age with that statement. Cup holders in every door panel, center consoles with multiple slots and small boxes, and some I'm told have multiple shelves in them. Most of these will come into use for what they were intended, but most will either be idle for the time we own the vehicle or be a collecting point for useless materials. I have a Honda and they have designed the best interior as far as I'm concerned..."very efficient". In the front passenger compartment lies a sloping compartment. In this compartment I managed to keep an old slate turkey call, it was retired after I lost the wood striker. I don't quite know how I came to do this but the call was used a storage box for flies. Yesterday while vacuuming I hit the box and tossed the contents of the box. I stopped to pick them up and noticed that I had created a beautiful and very useful wood fly box. I don't know how these flies came together but they could save the day if needed. Further examination of the flies once they were dusted showed a variety of dries,wets, and streamers. Some were pretty well beaten and chewed but still functional. So I cleaned the box, put some Armor All on it and put the flies back in there compartment. Bushwhacking a new blue line. Today was a day I chose to check out a new blue line. I had attempted this one other time and some how got turned around and never found it, this time I looked a bit further and there it was. The stream was at typical July flows with a water temp of 62 degrees. The stream bed is mostly rock, and slippery rock I'll add. Some of the stream has areas that have very muddy bottoms, but they to surprised me. Many of the plunges were swift and deep, with blowdowns and laurel tossed in for fun. The weather this day was better suited for lying on the beach within swimming range, or an air conditioned room tying flies. The air temp was around 80 and the humidity was oppressive. I was sweating like hell just tying on a fly. Thankfully it was shaded along the stream. It did not take long for the action to start. My first hookup took place in the pool with the tree. The fly floated and the trout rose. Not a surprise that the stream had brookies in it, but the surprise was when I brought the the fish to hand. A beautifully colored young male. I'm not a guy that gets upset when I loose a fish, it's part of the experience. But when you loose two of the biggest brook trout of the season, and from the same pool no less that required a swear word. 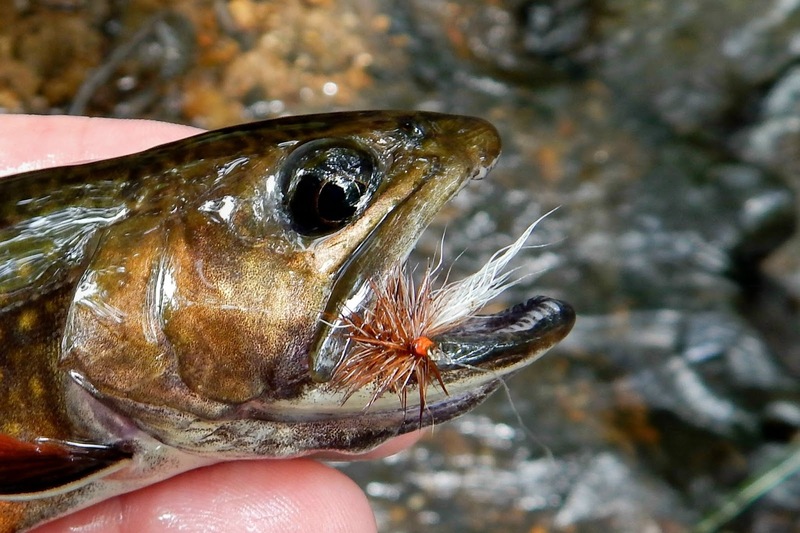 All brook trout are wonderful to take on the fly. Notice the dark body of this fish. You can have your stocked fish, make mine wild. I fished to the area just above this pool. I called it a day, the heat winning the match. Three bottles of water, and a forth cold one at the car, many brookies pricked and a few to hand, and another stream to further check just as soon as it's cooler.